The Couple Next Door starts off with a harmless get together between neighbours. However, the next thing we know, Anne and Marco's baby is kidnapped. The spotlight is put on the parents and their suspicious behaviour and past.. this leaves the readers confused and not being able to trust the narration.. my favourite thing when it comes to mystery novels: unreliable narrators. As the novel continued, the couple's not so perfect life and selves started to unravel.. I had my suspicions on who the kidnapper was and I was right... I feel when I guess the criminal too soon.. it gets boring to me.. especially when the reason behind the kidnapping was a bit.... anti climatic? however the author did have another twist in the end.. but I personally thought it was a bit too.... unrealistic? it just seemed the more I read.. the more the author seemed to through twist after twist at us just so no reader would have really predicted the ending? it seemed like that to me and that is why I would have rated the first half of the book 4 stars.. but the second half was really not satisfactory. I must say I really liked the addition of the detective's POV.. it brought outside insight into the situation, especially when we couldn't trust the narrators and wanted another opinion to this mystery. I have to say, I had some expectations from this book especially when I was a quarter of the way in.. and they weren't met, but it was still an overall enjoyable read, just not up to part with some other mystery novels I have read recently. Shari Lapena has written a smart story that is very well paced. 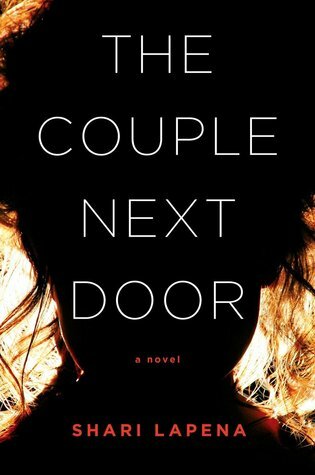 The Couple Next Door is filled with twists and turns and it will hold your interest from beginning to end. I loved this book and I can highly recommend it.